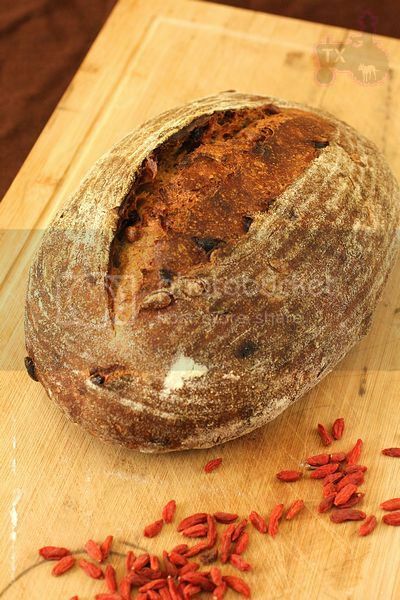 Often used in Chinese cooking, Goji berries are known to have all kinds of health benefits. 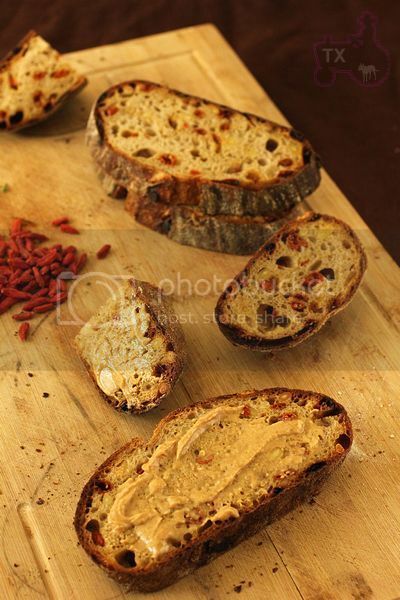 I often have dried Goji berries on hand to make soup, congee, or even tea with.They are good for me and pretty looking, but don't really have any strong taste, so I combined them with pine nuts in this loaf to jazz up the flavor. 1. Mix together and leave at room temp for 12 hours. 2. Mix together flour, water, and levain, autolyse for 20 to 60min, add salt, mix @ medium speed for 3-4 min until gluten starts to develope. Add Goji berries and pine nuts, mix @ slow speed until evenly distributed. 4. Shape into batard . 5. Proof face down in basket until the dough spings back slowly when pressed, about 90min in my case. 6. Bake at 450F with steam for the first 15min, lower the temperature to 430F, keep baking for 30 min. My rye starter is VERY fast, please adjust fermentation schedule to fit your own starter if you decide to give it a try. Goji berries add visual interests, while pine nuts made it so fragrant. Nutty and fragrant, it's perfect with some PB. 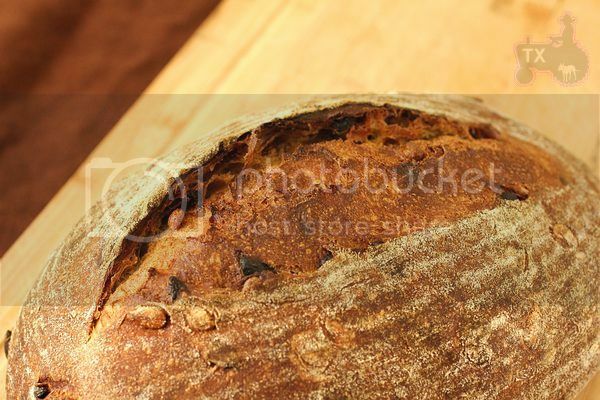 A beautiful loaf TxFarmer that I am sure is bursting with lots of 'nose and bouquet', as many of your fantastic recipes are. Yeah, putting them in tea is the one of the easiest way to eat goji berries. Maybe an odd question, but the problem I've had with pine nuts is that, being so smooth and somewhat lubricated by their fatty nature, they tend to fall out of the bread when I slice it. Is it just me? This is piñon country, so I can get local nuts in the fall and really like the idea of adding them to bread, but most of them just end up rolling around on the plate! Just curious if you've noticed this phenomenon as well. Yeah, I usually stir fry Goji berries with pine nuts and soy beans, a common Chinese dish. Intrigued by the eggplants idea, have to give it try! I am always impressed with your breads. Cheers. I thought I had the Tibeten variety, turns out I have Wolf berries instead. Sort of a bummer. :( I consulted the family herbal medicine woman in my family and she said it should be combined with ginger root or alisma plantago-aquatica (frog plantain) to balance out the properties. A ginger combination does sound good to me! I know a dry creek bed where I might find frog plantain... will go out looking (careful handling--fresh plant=poisonous) and dig up the roots and dry them. Have to do more research first. My plant is labeled Goji Berry but the latin name on the label is Lycium barbarum which makes it the Wolf berry. It also has thorns (barbarum) which got me searching around. The surest way to obtain authentic Goji berries are to go to Asian food shop or online shop specialized in Chinese or Korean foods, if you have any in your area. The more I investigate, the more I'm beginning to think that "goji" is like the term "apple." Every sort has different but similar properties. All I really know is that my tall bush has short but annoying thorns that I want to tie up and tame. I seem to collect quite a few thorny berry bushes... is that indicative of a cactaceous personality? My garden fends for itself. 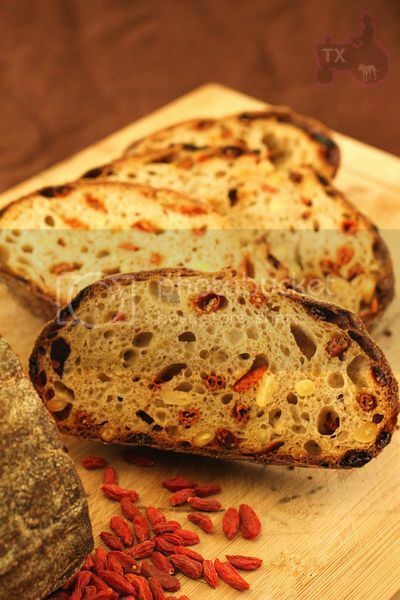 The goji berry bread sure looks scruptious! I've run into slippery pine nuts myself too. What about grating the nuts into flour? But the beauty is seeing the nut, not? If all the wolf berries are labeled goji berries, then... um... we all know how different apples can taste. I can't taste berries on line... I am curious how my berries will turn out. I love the color! As far as I can tell wolfberry == goji berry, then there are multiple types under that name. Lycium chinense Miller is more common, BUT Lycium barbarum L. is the type used in medicine. The little red dried goji berries I used here are Lycium barbarum L., they are the ones you can readily find in Asian markets. In Chinese cooking/medicine, goji berries are often combined with jujube ( red date, Chinese date, or Indian date) to make tea or hot sweet soup. Another dish I often make is stir fried goji berries and pine nuts, sometimes with fresh corns. Never heard of eating it with ginger, however, in Chinse medicine language, they are both "hot", so I suspect they would be good in the winter for a person who's "cold inside", but too much, they might lead to nose bleeding because "too much heat" inside. having deer in my yard makes berries with thorns imperitive! Otherwise you don't get any! LOL I have hawthorne shrubs (trees actually in height) which have 2 inch thorns and you can't get near them without having long scratches, but the deer leave them alone. They make wonderful haw jelly. On the subject of gardens fending for them selves, I have friends who have a small market garden, and am trying to talk them into hawthorn hedges for the deer problems! (then I can give away the small hawthorn shrubs that are growing all over my lawn) so far they haven't committed but I will keep trying! Have you read wiki article for goji berry read. Actually, if you search under 'goji berry,' it leads you to the article for wolfberry. Interesting, isn't it? I'd only known　them by 'kuko-no-mi (=berries of kuko)' , a Japanised name of the original Chinese name, '枸杞' because it was popular in Japan as an important ingredients for old Chinese medicinal/health cooking, and took me a while until the fashionable 'goji' is actually the same thing as 'kuko-no-mi,' that I'd known of for a long time.